The best kind of giardiniera has lots and lots of spicy peppers. The second-best kind of giardiniera has lots and lots of mild peppers. My personal favorite brand is Kelsey Ds, which offers both! Their special blend of peppers, carrots, cauliflower, celery, and gherkins marinates in a spiced soybean oil. I get the stuff straight from the source (I know the company owner — fancy right?) but it’s also available online! Dissolve yeast in warm water. Add the oil, sugar, salt and flour, mashing with sparkling-clean hands until a firm dough forms. Rest the dough ball on a floured surface; cover and rest for 10 minutes. … Roll out the dough to desired thickness. Oil a pizza pan and sprinkle with cornmeal. Transfer dough to prepared pan. Bake at 425° for 12-15 minutes or until browned. Add toppings; bake about 20 minutes longer. Preheat oven to 350°. Stir the breadcrumbs and water (or beer) together. Add the egg. Add the beef. Mush everything together until all the beefy, breadcrumby goodness is evenly distributed. Roll spoonfuls of the mixture into balls and place in a roasting pan, uncovered. Bake about 25 minutes. Makes about 24 one-inch meatballs. Preheat oven to 425°. Slather pre-baked crust with sauce. 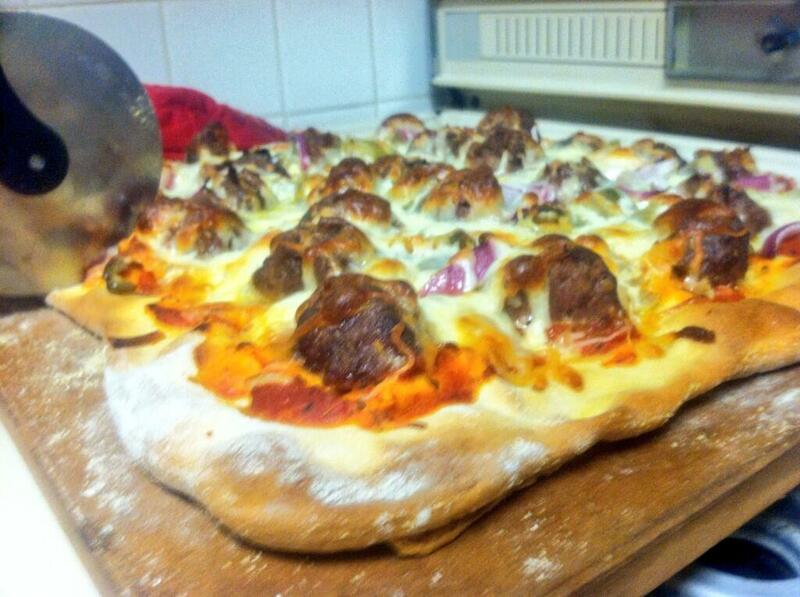 Layer meatballs, giardiniera, red onion, and cheese. Bake about 20 minutes. Cool, slice, EAT!! !